B3AC: Smart Balance Charger for 2S and 3S Li-PO batteries (7.4volt and 11.1volt). Plugs into AC wall outlet. Plug your battery's balance connector into the B3AC to charge the battery. Charge rate = approximately 700mA/hour. Fully automatic - no buttons to push. Has easy-to-read LED charge status indicators. Charger shuts off automatically when battery is full. Charges 7.4 volt and 11.1 volt battery packs. Dimensions of charger: approx. 4" x 2.25" x 1.25". Suitable for Li-PO batteries 350mAh or larger. WEB SPECIAL PRICING: $ 14.95 ea. CCDC :DC Power Cord for the CoolCharger A3. One end plugs into a 12-13.8VDC Socket, and other end plugs into side of CoolCharger A3. 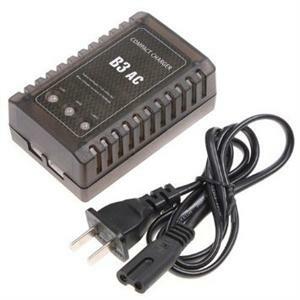 CCACPS : AC-DC Power Supply for CoolCharger A3. Plugs into 100-240VAC outlet. DC Output: 12VDC, 4A max output. Plugs directly into side of CoolCharger A3 (sold separately).